Simple & Practical: Playing with Fire for a month. Playing with Fire for a month. 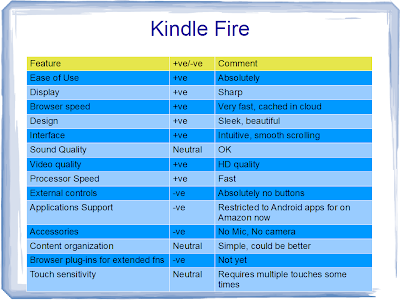 Now that I have owned Kindle Fire for a month, it's time to look back and document my own and only my own opinion about it. This disclaimer is necessary to not upset ipad fan club. 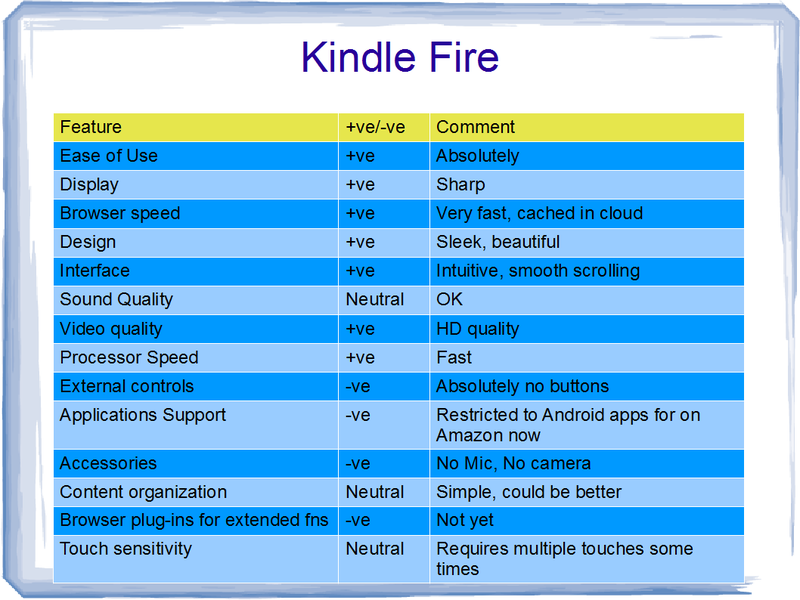 This is not meant to compare Fire with any other mobile device in the market. To surmise my findings in one sentence - it's not very often that you get more than what you paid for. That's Kindle Fire for you. How much more? It's up to every one to decide after reading this post. In my opinion Fire hits that sweet spot of providing you with adequate features with superior performance at a very very affordable price. It's no wonder Fire is flying off the shelf since its launch. For those with little patience for reading, the summary of my evaluation is presented here in a nice tabular format. I received the Fire in my mail after a month long wait time. I had placed an order on Amazon, immediately after the product announcement basically trusting the good reviews from analysts. Right from the time I opened the box I was hooked. Fire comes in a cardboard box with perforated edge that tears without help from scissors, there are no sticky tapes any where outside or inside the box. I was off and running in less than 5 minutes. The interface is intuitive and easy. It has its own quirks, but they don't rob you of your quality time. First off, let's get out of our way some well documented and commented on 'lack of features of Fire'. They are, absence of any buttons other than power button. Not having a button even for controlling volume is kind of annoying. The power button is at the bottom together with micro USB port and a jack for headphones. Because of the unusual placement of power button, it's possible that Fire goes to sleep by holding it in your lap. But bringing it back to life is easy enough - sliding the switch on the screen like an apple device. The Fire is not exactly light and because of its very thin edges it's hard to hold it in a hand for a long period of time without touching the screen and without slipping through your hands. I would recommend Amazon to provide grooves or impressions/dents on the edges to make it easier to hold. Fire does not have a microphone, neither does it have a camera. So for all those skype fans this could be a serious issue. Now on to the best part. I have used the Fire so far to do almost all my online activities like reading my emails from various personal accounts, using social networks like facebook, twitter, linkedin, watching videos on youtube, carrying out banking, investing functions, listening to local radio channels and Pandora, downloading books and apps from Amazon, watching HD quality movies from Amazon, sending documents to kindle over an email. Without a doubt, I am extremely happy and pleasantly surprised at its ease of use. The Fire boots remarkably fast, downloads web content at great speed, shows crystal clear images and videos. The screen rolls at a very fast pace showing the power of dual core processor, virtual keyboard is sensitive and fun to operate.The sound quality is acceptable and volume is loud enough for a noisy room. Streaming videos of movies and TV episodes works super fast and quality of the display is awesome. Now for the things I wish the Fire had -. I watch educational videos on you tube all the time. I really wanted to download them to Fire, so I could watch them when I want and where I want, which according to my knowledge is not possible today. The Silk browser does not have any plug-ins that could perform this task. So you are back to downloading videos to your pc and then uploading them to Fire. Another missing feature is the absence of folder structure. The content is automatically classified and stored in different sections like video, audio, books, magazines etc, but you can't access those from any other section that the menu at the top. The folder structure like windows explorer doesn't exist in Fire today. This prevents you from organizing your content in your own way. Now for the quirks I found a little bit annoying. When you are watching youtube video in full screen mode and want to adjust volume, the only way you could make the volume adjustment bar to appear is to tilt Fire at an angle (sometimes but not always clicking the small arrow at the bottom displays settings. Why only sometimes is something I need to figure out). When Kindle senses that it needs to go to a portrait mode from a landscape mode or vice versa, it displays the settings at that time. Once you adjust the volume, the video restarts from the beginning and not from where you left it before adjusting the volume. I am sure, there must be some work around, but I haven't found that yet. Another important feature I think is important to mention is uploading of documents to Kindle. It could be done in two ways. One by connecting your other device like PC that hosts the document or by sending the document as an attachment to an email to your kindle email address. This email address is automatically assigned to you when you register the Fire. Getting the doc uploaded through this email address is something you need to get used it. As for the kindle applications. Although Kindle's ecosystem is still limited, it is expected to grow very fast. So far I could all applications that I wanted like Facebook, Pandora, Radio streaming, Weather and most importantly Angry Birds - yeh! So friends, the Fire is an excellent and exciting product that competes with the best product in the world providing the best value in its class of products. Truly an excellent holiday gift, the Fire will bring you blessings from the recipient. Nicely written...Aag se khelthe rehna Maheshji!! !